HP Proliant DL380e Gen 8 Rack Server. Storage: 2 X 3000GB 7.2K 3.5" LFF SAS included (6tb RAW Storage). Rack Rails: Not Included . Server Options / upgrades . Backplane: 1x 12 Bay 3.5” LFF SATA /SAS /SSD. HP Proliant DL380e Gen 8 Rack Server. Storage: 2 X 3000GB 7.2K 3.5" LFF SAS included (6tb RAW Storage). Server Options / upgrades . Backplane: 1x 12 Bay 3.5” LFF SATA /SAS /SSD. (Takes up to 12 X SAS /SATA /SSD Drives, Add. ). HP P822 2GB RAID CARD. 8X 146GB 15K HARD DRIVES, WIPED AND TESTED. SPEC BELOW WITH HP DIAGNOSTIC TEST PRINT SUPPLIED. RAILS SUPPLIED. All units are 2nd user unless stated otherwise. Most units are from office upgrades. HP Proliant DL380P G8 Including HP Proliant DL380P G8 8 x 3.5" Bay Chassis. 2 x Heatsink (No CPU). Dell PowerEdge is a trademark of Dell Inc. HP is a trademark of HP Inc. PowerEdge is a trademark of Dell Inc.
HP DL380 G8 2U server 1x E5-2420, 16GB, P420/1GB FBWC,iLO 4 Includes 12 genuine caddies, one cpu with one heatsink raid card with 1gb flash and battery ready to go Collection in person only. 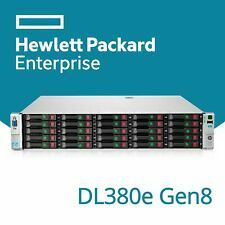 HP Proliant DL380p G8 Gen8, Dual XEON processors, Build Your Own! Model: HP ProLiant DL380e Gen8, HP DL380e G8. The HP ProLiant DL380e Gen8 sets the next generation standards of 2U 2-socket rack servers for the industry. RAM: 16GB DDR3 RAM Installed. Form Factor: Rack-Mount 2U. Model: HP ProLiant DL360p Gen8, 20-Cores, Cheap 1U. RAM: 64GB DDR3 RAM. All of our servers are refurbished to a very high standard. Internal parts (such as RAM and CPUs) are tested individually, and once the components are installed the system is tested in full. Model: HP ProLiant DL380e Gen8, HP DL380e G8, Storage server. The HP ProLiant DL380e Gen8 sets the next generation standards of 2U 2-socket rack servers for the industry. RAID: HP Smart Array P420 1GB FBWC. Model ProLiant DL380e Gen8. Product Line ProLiant. Ram Amount 8GB. Ram Type DDR3 SDRAM ECC. System has been fully tested. There are signs of use. Hard drive caddies and outer rack rails are not included. What Makes Us Different?. FACTORY SEALED SYSTEM BOARD. All Categories. HP Proliant DL380p G8. 25x 600Gb 10k SAS. We are able to source hard to find parts for Legacy systems through to the latest new in box parts for the latest generations of servers & storage systems. Tested and passed HP diagnostics. Model: HP ProLiant DL380p Gen8, HP DL380p G8. As you can see the DL380p Gen8 gives you massive potential for expansion, and safeguarding your data centers future growth. The answer is quite simple. HDD: 12 x 3.5" LFF SAS/SATA Hard Drive Bays (No Caddies Included). Model: HP ProLiant DL380p Gen8, HP DL380p G8. As you can see the DL380p Gen8 gives you massive potential for expansion, and safeguarding your data centers future growth. The answer is quite simple. RAM: 96GB DDR3 RAM Installed. B320i Dynamic Smart Array 512Mb cache. HP Proliant DL380e G8. Base Unit Only. We are able to source hard to find parts for Legacy systems through to the latest new in box parts for the latest generations of servers & storage systems. 2 x Xeon E5-2650 v2 @2.6GHz 8-core. We are able to source hard to find parts for Legacy systems through to the latest new in box parts for the latest generations of servers & storage systems. Tested and passed HP diagnostics. Model: HP ProLiant DL380p Gen8, HP DL380p G8. As you can see the DL380p Gen8 gives you massive potential for expansion, and safeguarding your data centers future growth. The answer is quite simple. These processors boast up to a 80% efficiency boost over the previous 5600 series processor. Model: HP ProLiant DL380p Gen8, HP DL380p G8. As you can see the DL380p Gen8 gives you massive potential for expansion, and safeguarding your data centers future growth. The answer is quite simple. RAM: 128GB DDR3 RAM Installed. HP Proliant DL380p Gen8 2U Performance Rack Server with 1x25 Backplane. 32GB (4x8GB) DDR3 RAM. HP Ethernet 1Gb 4-port 331FLR Adapter (4 x Ports). Rack Rails included. Dell Servers HP Servers Hard Drives Powervault Arrays Equallogic Storage Networking Tape Drives. PROCESSORS / 2 x E5-2665 2.4ghz 8 core xeons (16 CORES). SYSTEM HP DL380p GEN 8. HARD DRIVE / NONE 16 2.5" BAYS. any warranty seals have been broken or altered;. For more important inquiries. the serial number of the item, component or accessory has been altered, cancelled or removed;. RAID Card P420/1GB FBWC. Server Solutions. Credit or Debit Card accepted Worldwide. All refurbished hard drives are data wiped to NCSC standards. Your are in safe hands. Model: HP ProLiant DL380p Gen8 25x Bay, DL380p G8. RAM: 256GB DDR3 RAM. Form Factor: Rack-Mountable 2U. All of our servers are refurbished to a very high standard. Internal parts (such as RAM and CPUs) are tested individually, and once the components are installed the system is tested in full. HP Proliant DL380e G8. Base Unit Only. We are able to source hard to find parts for Legacy systems through to the latest new in box parts for the latest generations of servers & storage systems. Tested With Hp Insight Diagnostics. 25 SFF drive bays. 2 x Xeon E5-2650 v2 @2.6GHz 8-core. We are able to source hard to find parts for Legacy systems through to the latest new in box parts for the latest generations of servers & storage systems. HP ProLiant DL380p G8 2x 6-Core E5-2620 2GHz 2.4TB 40GB. Model No: Proliant DL380p G8. 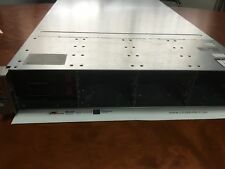 Rackmount 2U Server. 2 x 4GB DDR3 1Rx4 PC3-10600R Ram. 4 x 8GBDDR3 2Rx4 PC3-10600R Ram. In Full Working Order.